Spend two days tracking gorillas on the forested slopes of the ancient Virunga volcano chain in Africa’s oldest national park. 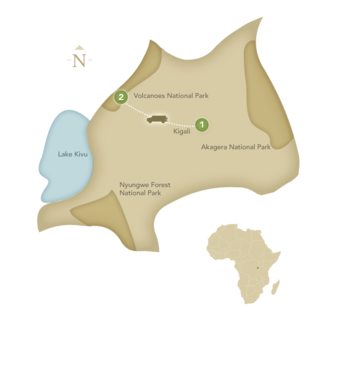 Established in 1925 to protect the mountain gorilla, the park was the base for famous American naturalist Dian Fossey’s research on the gorillas. 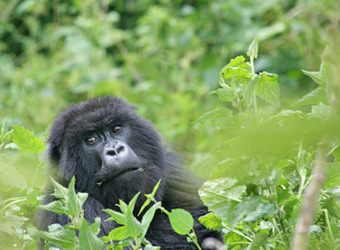 On the western edge of Rwanda bordering contiguous parks in Uganda and the Democratic Republic of the Congo, the region is home to approximately 604 mountain gorillas, just over half of the world’s total. With the gorillas just a short 2- to 3-hour drive from Kigali, Rwanda is the best choice for a quick trip to trek the mountain gorillas. This itinerary can stand on its own, but is really designed to be an add-on to another African safari destination. Located in the geographical heart of Rwanda, compact, low-rise Kigali is the country’s rapidly growing capital and center of commerce. The attractive city sprawls across verdant mountains and enjoys a pleasant high-altitude climate. Kigali is home to fine contemporary hotels and restaurants whose international menus incorporate local flavors and historic Belgian influence. 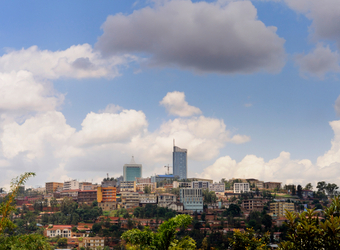 Kigali's lively and colorful crafts market is considered one of the best in Africa. Meals at camps and lodges.